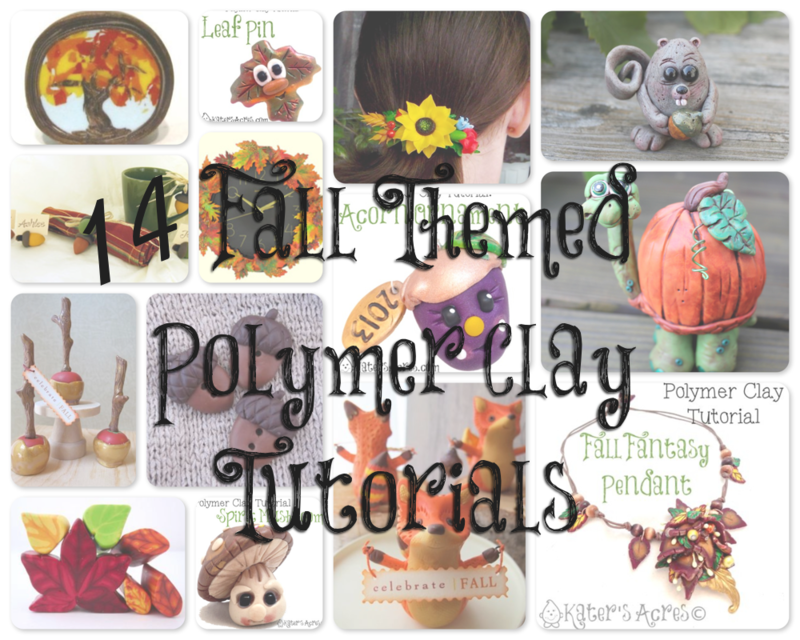 Looking for a fall polymer clay project? Fall is my favorite time of year. I love everything about it; from the apples, leaves, cider, crisp air, to the smell of drying leaves on the earth. I just love it. I often am my most creative during the September-November months because of this. To help jump-start your creative endeavors, I’ve put together a giant mash-up of 14 fall polymer clay tutorials you will love. Looking for something creative to make this fall? Here’s a mashup of a bunch of different tutorials that you can learn from to make your own fall creation. Whether you are having a party, decorating a tree, or just getting in the spirit, this conglomeration of projects will have your head spinning with lots of ideas to jump start your creativity. Fall Tree Cane by Meg Newberg. Cute Leaf Pin by KatersAcres. Fall Barrette by Luna, as posted by Kollika. Squirrel by Miranda Farrand for Sculpey. Pumpkin Turtle by Miranda Farrand for Sculpey. Fall Fantasy Pendant by KatersAcres. Fox Figurine by Swirly Designs for Sculpey. Fall Acorn Ornament by KatersAcres. Fall Leaf Canes by Meg Newberg. Faux Miniature Caramel Apples by Swirly Designs for Sculpey. Acorn Buttons by Meg Newberg. Fall Leaf Clock from Sculpey. Fall is great! The colors are so inspiring. A hot cup of tea and a visit to KatersAcres makes for a nice afternoon. That’s so sweet! Thank you Sharon I’m glad you are enjoying the site.